After 36 years with Alaska Airlines, Captain Mike Swanigan will make his final flight this weekend. “Captain Swani” plans to retire after one last round-trip Sunday: Flight 648 Seattle-Tucson and then Flight 641 Tucson-Seattle, scheduled to arrive about 4:30 p.m.
Swanigan became one of Alaska’s most recognized employees after he starred in a series of TV commercials alongside Seattle quarterback and Chief Football Officer Russell Wilson – more on that in a minute. Swanigan says he tries to live each day with gratitude – it’s his philosophy, his humor and his dynamic approach to life that has made him a legend at Alaska Airlines. “My parents taught me: If you aren’t making someone else’s day, you don’t deserve to be on planet Earth,” Swanigan said. 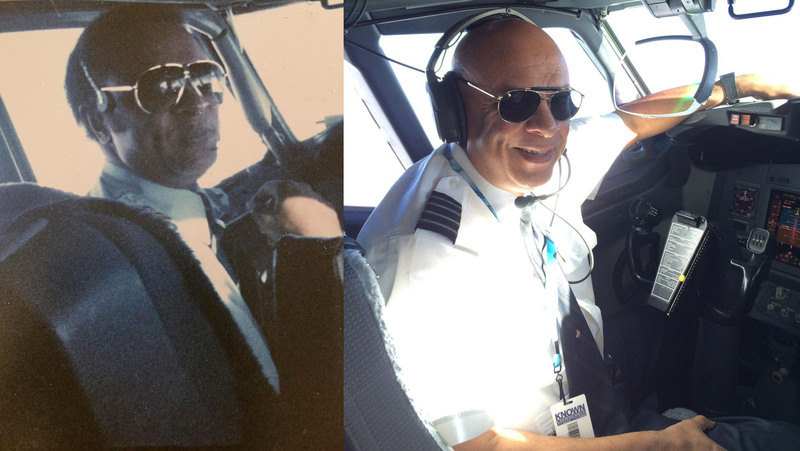 Swanigan, 65, raised an Air Force brat, knew he wanted to be a pilot since the first grade when a fellow student brought in a model of an American Airlines Boeing 707. Swanigan was the second African-American pilot hired at Alaska Airlines, and eventually the company’s first African-American vice president. “I was nervous coming into that environment in the airline business, but I was really welcomed by senior pilots at Alaska; they took me under their wing and mentored me,” he said. He served many roles over the years: Instructor/check pilot, chief pilot from 1993-1995 and vice president of flight operations from 1995-2000. He even officiated an onboard wedding ceremony for an employee couple during a delivery flight in 2005. Among the countless flights Swanigan has piloted over the years, the inaugural flights to Russia in 1991 stand out. “It was exhilarating and scary building the bridge between Russian and American people,” he says. Swanigan will never forget his first training flight as a commercial airline pilot with Alaska. He watched Mt. St. Helens erupt right in front of him. “It wasn’t scary because I felt safe but I was absolutely in awe,” he said. Retired Alaska Airlines pilot David Smith and Swanigan’s best friend for 33 years, said that attitude has acted as a magnet, attracting positivity and success everywhere he goes. Smith said that Swanigan has never sought out success and recognition – it has always found him. Swanigan’s commercial collaboration with Wilson was the result of a prank that Wilson pulled at a 2013 event designed to inspire students at schools plagued with high dropout rates. Swanigan was acting as master of ceremonies and Wilson was the guest of honor. The two had met for the first time earlier that day over lunch. Swanigan, dressed in his full pilot attire, decided to remove his hat and jacket to be more casual on stage. The hat and coat were whisked away to the green room where Wilson was waiting to go out on stage. 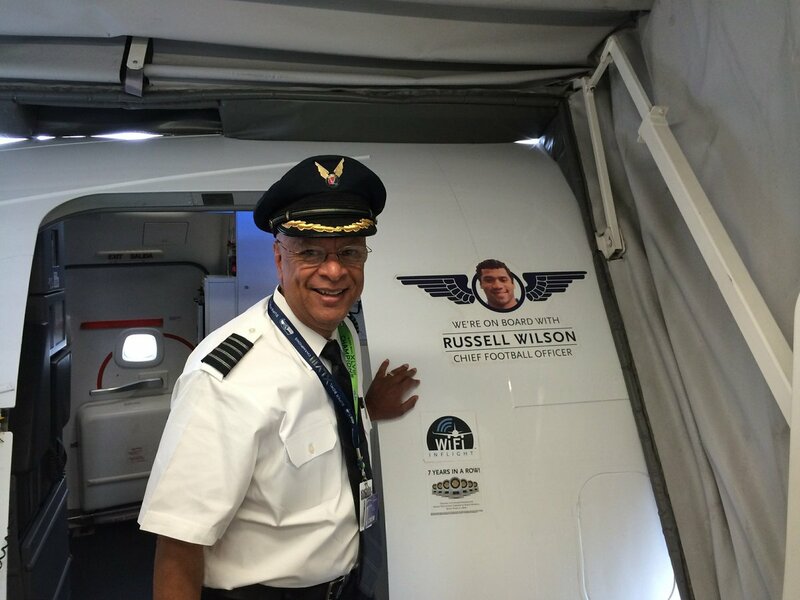 Swanigan was shocked when Wilson appeared before the crowd wearing the pilot’s hat and coat. “I was surprised it fit him as a football player; he looked better than I did in it,” Swanigan said. The two played off of each other and had a great time on stage. The chemistry wasn’t lost on anyone else either. It wasn’t long before Swanigan was invited to star in an Alaska Airlines commercial with Wilson. In between takes during a 12-hour day of filming, Wilson and Swanigan were joking around. The cameras happened to be rolling. “Captain Swani, can I borrow your hat?’” Wilson said. Swanigan said “What? !” as he laughed at Wilson. The two quickly forgot about the exchange in the midst of more filming. Later he was shocked to see that the exchange ended up on the commercial. Since the ads aired in 2014 and 2015, Swanigan is constantly recognized when he’s in uniform. He is a little more caught off guard when he is recognized when he’s not in uniform. Recent incidents include a shopping trip at Costco, and at a breakfast café in Arizona where Swanigan now lives. Although his recent fame has made him more recognizable to passengers, it didn’t change his relationships with his co-workers. Swanigan, who also created a podcast, Talking Flight where he interviews fellow pilots and aviation industry professionals, said leaving Alaska will be bittersweet. Swanigan’s future plans are of little surprise to those who know him well – to expand his professional speaking practice to include motivational speeches at a variety of venues, so he can continue to inspire by sharing his experiences with the world. 16 comments on "Swani song: Captain Mike Swanigan to make his final flight"
Sing Chesnuts roasting on an open fire in the Arctic village of Kotzebue! He has a beautiful baratone voice! Congrats, Swani and Susan. Class acts. What a great story of a “Man on a Mission”. I’m retired from AA and am friends with Jim Tillman; first black AA pilot and on-air TV weather man in Chicago for many years, He and Joanie are now retired in AZ. As a Jr. gate agent I always liked have Jim as the Capt., since I knew I’d get an On-time Departure. Fantastic story! My best wishes to Captain Swanigan! Congratulations and enjoy your retirement Captain Swanigan. Congratulations “Captain Swani”…! A well-earned retirement indeed. Thank-you for your dedications and service. As a retired USAF guy, just curious what aircraft you flew for the Alaska ANG? I worked for him he is a class act! you will sorely be missed. Congratulations on your retirement! Enjoy, it was always a pleasure to run into you on flights, greeting everyone with that smile! Just landed in Seattle from Tucson. Last flight. A delight. Congrats on retirement! I’m ATC in SEA. It’s been a pleasure working with you. It is a shame that the FAA forces our most qualified airline Captains to retire for no other reason than because they are 65 years old. We need more not less experienced, qualified Captains in the cockpit. This may be Capt. Swanigan’s last flight, but I am sure that we will hear more from him in his well-earned retirement. He has much more to offer in the future. Well done, Capt. Swanigan. “Swan Song” may now be appropriate, but I am sure that “we will hear from him “igan”. Have a good life Capt. Mike and keep smiling. Thank you for your service. From B.C. Canada. Your airline is the best as far as I’m concerned!!!!!!!!!!!!!!!!!!!!!!!!!!!!!!!!!!! Please keep it going.